Lovely renovated apartment is located in a private area of Port Grimaud South. Located at the end of an island, it has a wonderful panoramic view on the canal so that one can enjoy the view on the boats passing while relaxing on a deckchair. Inside, a wide bright living-room with a sofa-bed and a fully equipped open kitchen, a bedroom with 2 single beds joined together and a shower-room. On the canal side, a large balcony to have lunch or just have a rest. A private numbered parking space. 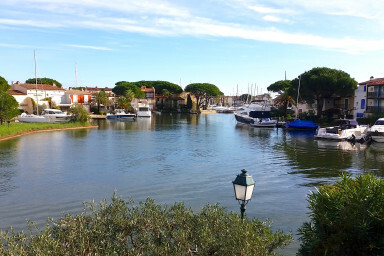 A cosy apartment in Port Grimaud! NEW : The bed linen and towels are now included in all our rentals. The bed linen and towels will be delivered in packages for the number of people planned at the booking. Possibility to make beds in addition. Additional fees will be applied for any extra person. The final cleaning is not included but can be done in addition. No animals, (except with the written agreement of the agency). A cancellation insurance can be suscribed as an extra. Contract to send back to the agency. A deposit via credit card requested upon arrival.